7 Interview Don'ts Check out the seven tips to find out what you should not be doing during and prior to your job interview. 1 7 Interview Don'ts Check out the seven tips to find out what you should not be doing during and prior to your job interview. 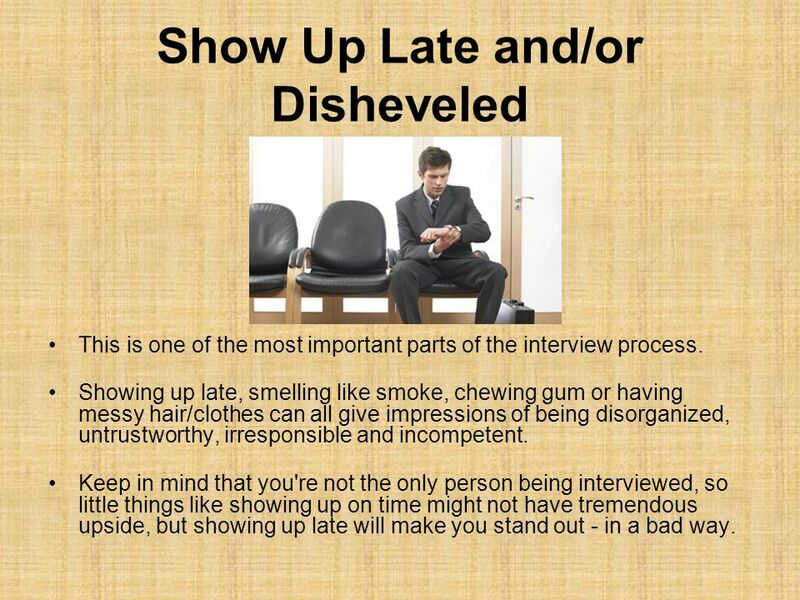 2 Show Up Late and/or Disheveled This is one of the most important parts of the interview process. Showing up late, smelling like smoke, chewing gum or having messy hair/clothes can all give impressions of being disorganized, untrustworthy, irresponsible and incompetent. Keep in mind that you're not the only person being interviewed, so little things like showing up on time might not have tremendous upside, but showing up late will make you stand out - in a bad way. 3 Leave Your Cell Phone On How many times have you been somewhere - at the movies, in a class, at work - and all of a sudden you hear the latest Black Eyed Peas song blaring out of someone's purse. It'll be a small thing that says a lot: irresponsible, forgetful, unreliable. At worst it could show that you're not taking the interview seriously and are not interested in the job. 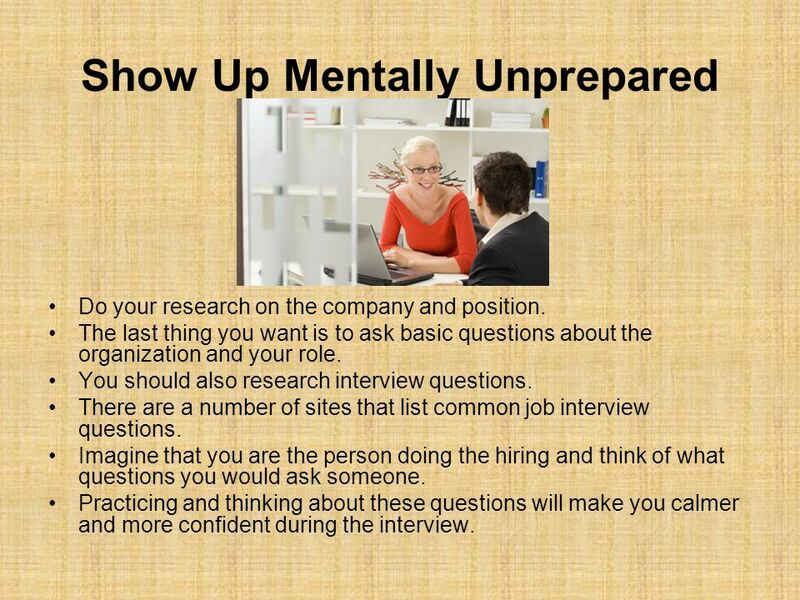 4 Show Up Mentally Unprepared Do your research on the company and position. The last thing you want is to ask basic questions about the organization and your role. You should also research interview questions. There are a number of sites that list common job interview questions. Imagine that you are the person doing the hiring and think of what questions you would ask someone. Practicing and thinking about these questions will make you calmer and more confident during the interview. 5 Show Up Physically Unprepared Physically prepared means showing up with the correct physical objects; bring an extra copy of your CV and reference list; bring a pen and notebook to write down any pertinent information or phone numbers. 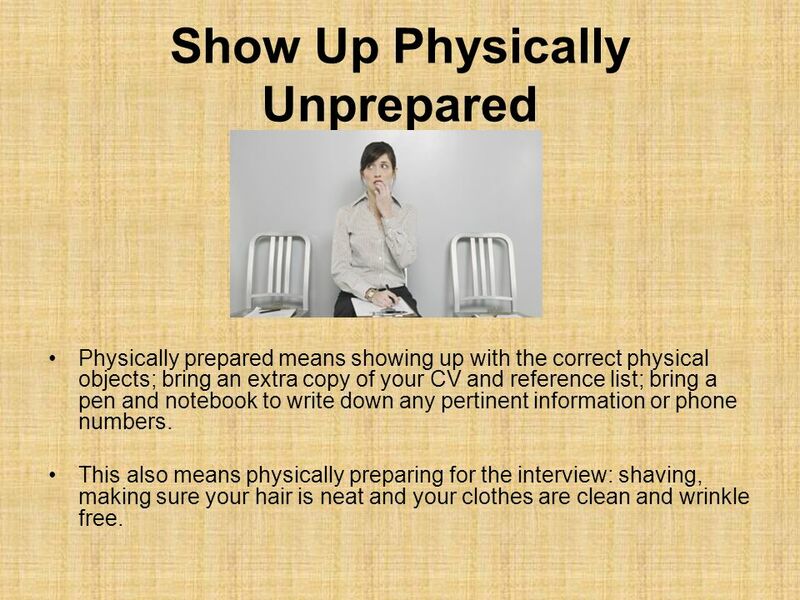 This also means physically preparing for the interview: shaving, making sure your hair is neat and your clothes are clean and wrinkle free. 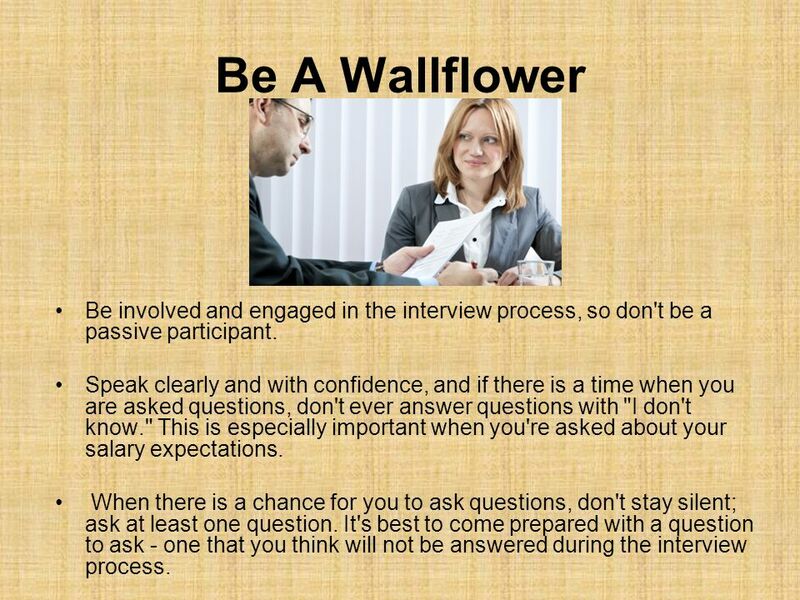 6 Be A Wallflower Be involved and engaged in the interview process, so don't be a passive participant. Speak clearly and with confidence, and if there is a time when you are asked questions, don't ever answer questions with "I don't know." This is especially important when you're asked about your salary expectations. When there is a chance for you to ask questions, don't stay silent; ask at least one question. It's best to come prepared with a question to ask - one that you think will not be answered during the interview process. 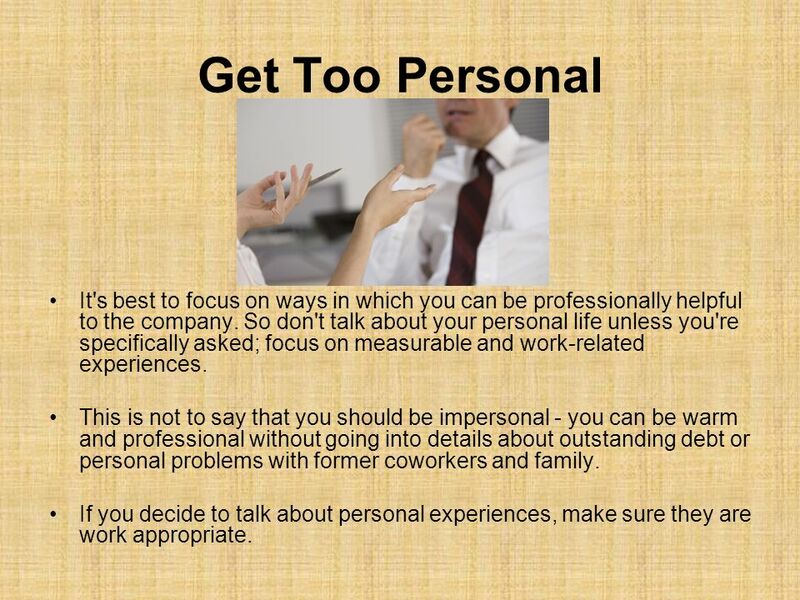 7 Get Too Personal It's best to focus on ways in which you can be professionally helpful to the company. So don't talk about your personal life unless you're specifically asked; focus on measurable and work-related experiences. This is not to say that you should be impersonal - you can be warm and professional without going into details about outstanding debt or personal problems with former coworkers and family. If you decide to talk about personal experiences, make sure they are work appropriate. 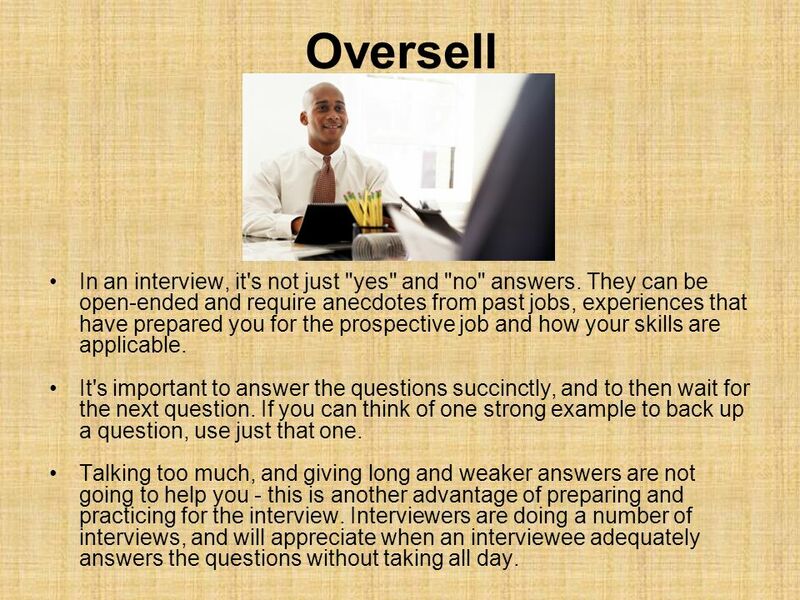 8 Oversell In an interview, it's not just "yes" and "no" answers. They can be open-ended and require anecdotes from past jobs, experiences that have prepared you for the prospective job and how your skills are applicable. It's important to answer the questions succinctly, and to then wait for the next question. If you can think of one strong example to back up a question, use just that one. Talking too much, and giving long and weaker answers are not going to help you - this is another advantage of preparing and practicing for the interview. Interviewers are doing a number of interviews, and will appreciate when an interviewee adequately answers the questions without taking all day. 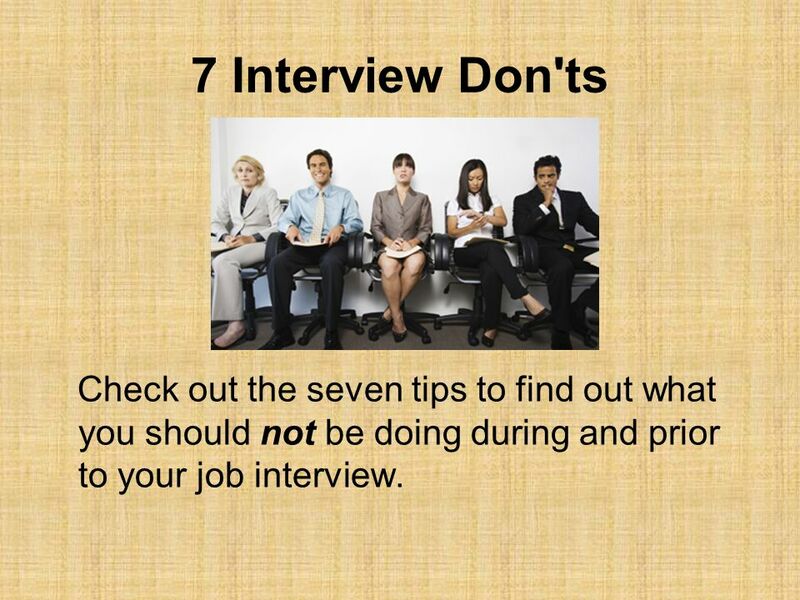 Download ppt "7 Interview Don'ts Check out the seven tips to find out what you should not be doing during and prior to your job interview." Telephone Interviews Telephone interviews are a popular way for some employers to reduce the number of face to face interviews that they have for a vacancy. Preparation What to bring Appearance Traditional interview Phone interview Final notes. Cleveland/Bradley Chamber of Commerce Senior Mock Interviews. 10.02 Career Development Techniques Sherry Brooks David W. Butler HS August 27, 2009. THE INTERVIEW Getting Ready!. TIP #1: DO YOUR HOMEWORK! Get hints and ideas from the best teachers you know. Get hints and ideas from the best teachers. “Do’s & Don’ts” for Successful Interviewing You never get a second chance to make a first impression!! ROADMAPS- Session 5. In this session you’ll learn: 1.How to prepare for a job interview. 2.What TO DO on a job interview. 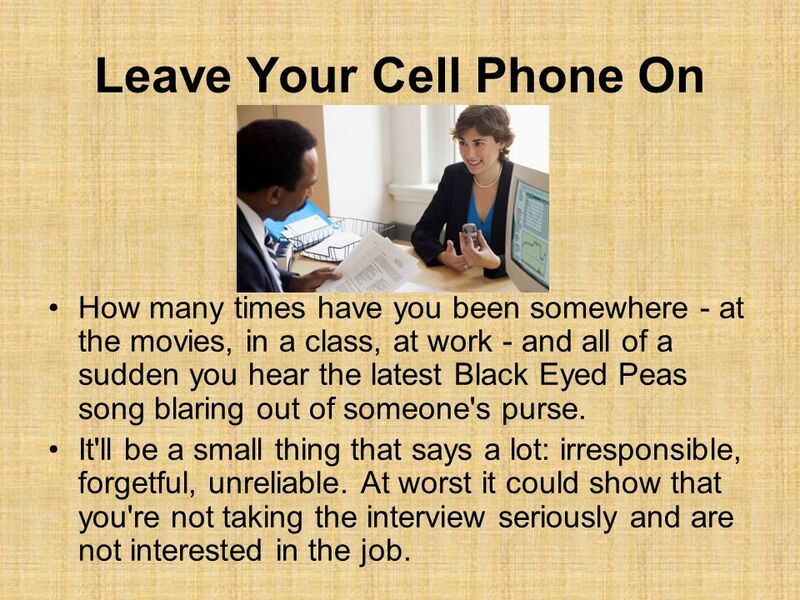 3.What NOT TO DO on a job interview. Job Seeking Skills Participate in a job interview. MARKETING YOURSELF The Interview 2 What is an interview? An opportunity for an employer to determine if the candidate is right for the job Does he/she. Applications and Interviews Tips for Getting a Job. Chapter 13 Interviewing Skills. Interviewing is Important - Don’t prepare – Dress inappropriately – Poor communication skills – Too much communication. Interviewing Skills CNED 577 Andrew Harden December 1, 2008. How to deal with interview effectively. What is interview ? A face-to-face discussion between the interviewer and interviewee. It’s a way for employers.